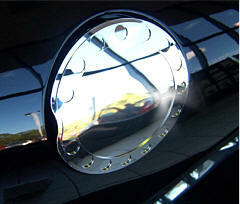 This extremely highly polished stainless formed steel cap simply fits right on top your of existing cap. It is a real attention getter. Easy to mount in minutes. You do not have to remove any of your existing parts. Really stands out and gets compliments. 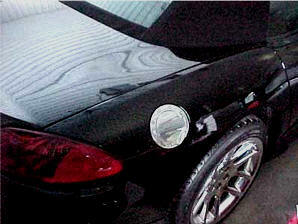 Looking to add a little touch of the Viper GTS fuel door? 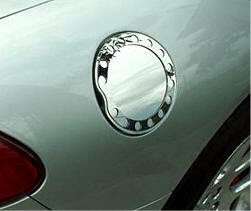 Viper chromed billet aluminum fuel door. Now you can have the race look you always wanted. No drilling required. 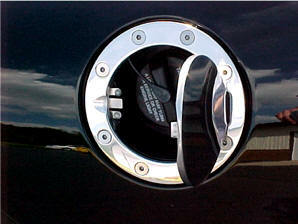 Great partner with the SRT-10 locking gas cap. Comes with everything you need to mount it. 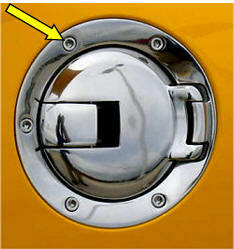 If you want a locking fuel door please contact us. Factory original. All metal with triple chrome plating, includes door with latch and outside trim ring. Stock gas cap assembly from Dodge. Set of 5 factory Allen screws for factory Coupe Gas Cap.